The Tata Institute for Genetics and Society's inaugural research initiatives leverage new technologies developed at UC San Diego based on self-propagating genetic elements we refer to as “Active Genetics." 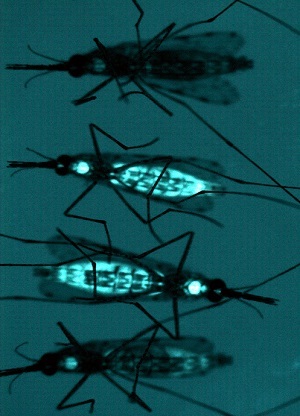 Pioneering experiments conducted at UC San Diego and UC Irvine have demonstrated that the malaria vector mosquito Anopheles stephensi can be genetically engineered using Active Genetics to express genes targeted against the malarial parasite Plasmodium falciparum, and that this new trait is inherited by nearly all of the mosquitoes’ progeny. Institute researchers and collaborators are expanding on this work with a goal of developing mosquito strains that may ultimately be used to substantially reduce malaria transmission, using a vector replacement rather than a vector-elimination strategy. In addition to combating malaria, a disease that causes an estimated 450,000 worldwide deaths per year, this approach may also be leveraged against other mosquito-borne-disease agents, including Dengue, Chikungunya and Zika virus. The Institute’s vector-borne disease program brings together experts from molecular biology, entomology, public health, community engagement and regulation. Future field trials will adhere to guidelines developed by the World Health Organization, National Academies of Sciences and regulatory agencies of the United States and India. The Institute will follow a phased approach to test both safety and efficacy of the strains as our work progresses. Several potentially impactful applications of Active Genetics are also being explored by a network of highly interactive faculty at UC San Diego who seek to develop this platform for use in other invertebrate species, vertebrates and plants. Applications include cell engineering, control of crop pests, development of new agricultural crop strains, creation of new humanized mouse models for studying and treating diseases such as cancer and potentially restoring microbial sensitivity to antibiotics.